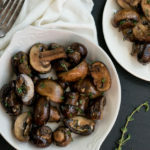 If your mushrooms are large, cut them in half. If you have small mushrooms, they should be fine. Melt the ghee in a skillet over medium-high heat. Add the garlic and mushrooms and sauté for 5 minutes, until the mushrooms have browned. Sprinkle with thyme and stir to incorporate.